Normally when food or liquid enters your stomach, a band of muscle at the lower end of your esophagus closes off the esophagus. 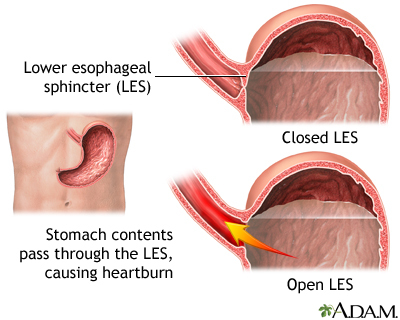 This band is called the lower esophageal sphincter (LES). If this band does not close tightly enough, food or stomach acid can back up (reflux) into the esophagus. 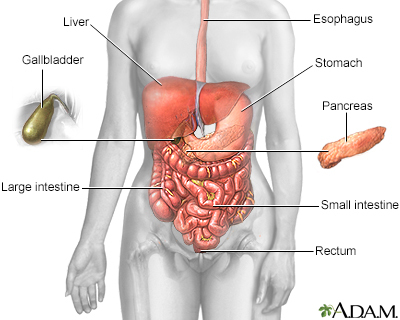 The stomach contents can irritate the esophagus and cause heartburn and other symptoms. Heartburn is more likely if you have a hiatal hernia. 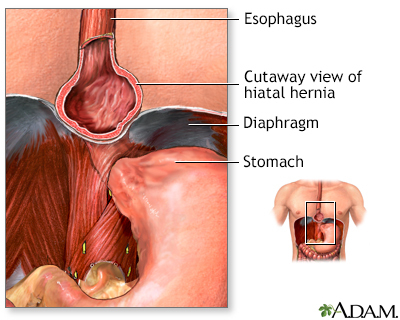 A hiatal hernia is a condition which occurs when the top part of the stomach pokes into the chest cavity. This weakens the LES so that it is easier for acid to back up from the stomach into the esophagus. Stop smoking or using tobacco. Chemicals in cigarette smoke or tobacco products weaken the LES. H2 blockers, like Pepcid AC, Tagamet HB, Axid AR, and Zantac, reduce stomach acid production. Proton pump inhibitors, like Prilosec OTC, Prevacid 24 HR, and Nexium 24 HR stop nearly all stomach acid production. 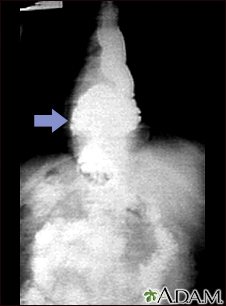 This X-ray shows the upper portion of the stomach protruding through the diaphragm (hiatal hernia). A hiatal hernia occurs when part of the stomach protrudes up into the chest through the sheet of muscle called the diaphragm. This may result from a weakening of the surrounding tissues and may be aggravated by obesity and/or smoking. A band of muscle fibers, the lower esophageal sphincter, closes off the esophagus from the stomach. If the sphincter does not close properly, food and liquid can move backward into the esophagus and cause heartburn and other symptoms known as gastroesophageal disease (GERD). To alleviate symptoms dietary changes and medications are prescribed. For a patient who has persistent symptoms despite medical treatment, an anti-reflux operation may be an option.